The history of Wisconsin encompasses the story not only of the people who have lived in Wisconsin since it became a state of the U.S., but also that of the Native American tribes who made their homeland in Wisconsin, the French and British colonists who were the first Europeans to live there, and the American settlers who lived in Wisconsin when it was a territory. Since its admission to the Union on May 29, 1848 as 30th state, Wisconsin has been ethnically heterogeneous, with Yankees being among the first to arrive from New York and New England. They dominated the state's heavy industry, finance, politics and education. Large numbers of European immigrants followed them, including German Americans, mostly between 1850 and 1900, Scandinavians (the largest group being Norwegian Americans) and smaller groups of Belgian Americans, Dutch Americans, Swiss Americans, Finnish Americans, Irish Americans and others; in the 20th century, large numbers of Polish Americans and African Americans came, settling mainly in Milwaukee. Politically the state was predominantly Republican until recent years, when it became more evenly balanced. The state took a national leadership role in the Progressive Movement, under the aegis of Robert M. La Follette, Sr. and his family, who fought the old guard bitterly at the state and national levels. The "Wisconsin Idea" called for the use of the higher learning in modernizing government, and the state is notable for its strong network of state universities. The first known inhabitants of what is now Wisconsin were Paleo-Indians, who first arrived in the region in about 10,000 BC at the end of the Ice Age. The retreating glaciers left behind a tundra in Wisconsin inhabited by large animals, such as mammoths, mastodons, bison, giant beaver, and muskox. The Boaz mastodon and the Clovis artifacts discovered in Boaz, Wisconsin show that the Paleo-Indians hunted these large animals. They also gathered plants as conifer forests grew in the glaciers' wake. With the decline and extinction of many large mammals in the Americas, the Paleo-Indian diet shifted toward smaller mammals like deer and bison. During the Archaic Period, from 6000–1000 BC, mixed conifer-hardwood forests as well as mixed prairie-forests replaced Wisconsin's conifer forests. People continued to depend on hunting and gathering. Around 4000 BC they developed spear-throwers and copper tools such as axes, adzes, projectile points, knives, perforators, fishhooks and harpoons. Copper ornaments like beaded necklaces also appeared around 1500 BC. These people gathered copper ore at quarries on the Keweenaw Peninsula in Michigan and on Isle Royale in Lake Superior. They may have crafted copper artifacts by hammering and folding the metal and also by heating it to increase its malleability. However it is not certain if these people reached the level of copper smelting. Regardless, the Copper Culture of the Great Lakes region reached a level of sophistication unprecedented in North America. The Late Archaic Period also saw the emergence of cemeteries and ritual burials, such as the one in Oconto. The Early Woodland Period began in 1000 BC as plants became an increasingly important part of the people's diet. Small scale agriculture and pottery arrived in southern Wisconsin at this time. The primary crops were maize, beans and squash. Agriculture, however, could not sufficiently support these people, who also had to hunt and gather. Agriculture at this time was more akin to gardening than to farming. Villages emerged along rivers, streams and lakes, and the earliest earthen burial mounds were constructed. The Havana Hopewell Culture arrived in Wisconsin in the Middle Woodland Period, settling along the Mississippi River. The Hopewell people connected Wisconsin to their trade practices, which stretched from Ohio to Yellowstone and from Wisconsin to the Gulf of Mexico. They constructed elaborate mounds, made elaborately decorated pottery and brought a wide range of traded minerals to the area. The Hopewell people may have influenced the other inhabitants of Wisconsin, rather than displacing them. The Late Woodland Period began in about 400 AD, following the disappearance of the Hopewell Culture from the area. The people of Wisconsin first used the bow and arrow in the final centuries of the Woodland Period, and agriculture continued to be practiced in the southern part of the state. The effigy mound culture dominated Southern Wisconsin during this time, building earthen mounds in the shapes of animals. Unlike earlier mounds, many of these were not used for burials. Examples of effigy mounds still exist at High Cliff State Park and at Lizard Mound County Park. In northern Wisconsin people continued to survive on hunting and gathering, and constructed conical mounds. People of the Mississippian culture expanded into Wisconsin around 1050 AD and established a settlement at Aztalan along the Crawfish River. While begun by the Caddoan people, other cultures began to borrow & adapt the Mississippian cultural structure. This elaborately planned site may have been the northernmost outpost of Cahokia, although it is also now known that some Siouan peoples along the Mississippi River may have taken part in the culture as well. Regardless, the Mississippian site traded with and was clearly influenced in its civic and defensive planning, as well as culturally, by its much larger southern neighbor. A rectangular wood-and-clay stockade surrounded the twenty acre site, which contained two large earthen mounds and a central plaza. One mound may have been used for food storage, as a residence for high-ranking officials, or as a temple, and the other may have been used as a mortuary. The Mississippian Culture cultivated maize intensively, and their fields probably stretched far beyond the stockade at Aztalan, although modern agriculture has erased any traces of Mississippian practices in the area. Some rumors also speculate that the people of Aztalan may have experimented slightly with stone architecture in the making of a man-made, stone-line pond, at the very least. While the first settler on the land of what is now the city supposedly reported this, he filled it in and it has yet to be rediscovered. Both Woodland and Mississippian peoples inhabited Aztalan, which was connected to the extensive Mississippian trade network. Shells from the Gulf of Mexico, copper from Lake Superior and Mill Creek chert have been found at the site. Aztalan was abandoned around 1200 AD. The Oneota people later built agriculturally based villages, similar to those of the Mississippians but with the extensive trade networks, in the state. By the time the first Europeans arrived in Wisconsin, the Oneota had disappeared. The historically documented inhabitants, as of the first European incursions, were the Siouan speaking Dakota Oyate to the northwest, the Chiwere speaking Ho-Chunk (Winnebago) & The Algonquian Menominee to the northeast, with their lands beginning approximately north of Green Bay. The Chiwere lands start south of Green Bay & flow between rivers to the southwest. Over time, other tribes would come to inhabit the land, such as the Ojibwe, the Illinois the Fauk, the Sauk & the Mahican --  The last group having been sent west from New York as a lesser known consequence of the Indian Removal Act of 1830, which also affected native peoples still living in New York, Ohio, Michigan & Indiana at the time. That being said, the U.S. had already been pressuring many tribes to migrate from these regions for several decades beforehand & seized land from tribes who sided against them in the Shawnee Wars & the War of 1812 as a consequence. The first European known to have landed in Wisconsin was Jean Nicolet. In 1634, Samuel de Champlain, governor of New France, sent Nicolet to contact the Ho-Chunk people, make peace between them and the Huron and expand the fur trade, and possibly to also find a water route to Asia. Accompanied by seven Huron guides, Nicolet left New France and canoed through Lake Huron and Lake Superior, and then became the first European known to have entered Lake Michigan. Nicolet proceeded into Green Bay, which he named La Baie des Puants (literally "The Stinking Bay"), and probably came ashore near the Red Banks. He made contact with the Ho-Chunk and Menominee living in the area and established peaceful relations. Nicolet remained with the Ho-Chunk the winter before he returned to Quebec. The Beaver Wars fought between the Iroquois and the French prevented French explorers from returning to Wisconsin until 1652-1654, when Pierre Radisson and Médard des Groseilliers arrived at La Baie des Puants to trade furs. They returned to Wisconsin in 1659-1660, this time at Chequamegon Bay on Lake Superior. On their second voyage they found that the Ojibwe had expanded into northern Wisconsin, as they continued to prosper in the fur trade. They also were the first Europeans to contact the Santee Dakota. They built a trading post and wintered near Ashland, before returning to Montreal. In 1665 Claude-Jean Allouez, a Jesuit missionary, built a mission on Lake Superior. Five years later he abandoned the mission, and journeyed to La Baie des Puants. Two years later he built St. Francis Xavier Mission near present-day De Pere. In his journeys through Wisconsin, he encountered groups of Native Americans who had been displaced by Iroquois in the Beaver Wars. He evangelized the Algonquin-speaking Potawatomi, who had settled on the Door Peninsula after fleeing Iroquois attacks in Michigan. He also encountered the Algonquin-speaking Sauk, who had been forced into Michigan by the Iroquois, and then had been forced into central Wisconsin by the Ojibwe and the Huron. The next major expedition into Wisconsin was that of Father Jacques Marquette and Louis Jolliet in 1673. After hearing rumors from Indians telling of the existence of the Mississippi River, Marquette and Joliet set out from St. Ignace, in what is now Michigan, and entered the Fox River at Green Bay. They canoed up the Fox until they reached the river's westernmost point, and then portaged, or carried their boats, to the nearby Wisconsin River, where they resumed canoeing downstream to the Mississippi River. Marquette and Joliet reached the Mississippi near what is now Prairie du Chien, Wisconsin in June, 1673. Nicolas Perrot, French commander of the west, established Fort St. Nicholas at Prairie du Chien, Wisconsin in May, 1685, near the southwest end of the Fox-Wisconsin Waterway. Perrot also built a fort on the shores of Lake Pepin called Fort St. Antoine in 1686, and a second fort, called Fort Perrot, on an island on Lake Peppin shortly after. In 1727, Fort Beauharnois was constructed on what is now the Minnesota side of Lake Pepin to replace the two previous forts. A fort and a Jesuit mission were also built on the shores of Lake Superior at La Pointe, in present-day Wisconsin, in 1693 and operated until 1698. A second fort was built on the same site in 1718 and operated until 1759. These were not military posts, but rather small storehouses for furs. During the French colonial period, the first black people came to Wisconsin. The first record of a black person comes from 1725, when a black slave was killed along with four French men in a Native American raid on Green Bay. Other French fur traders and military personnel brought slaves with them to Wisconsin later in 1700s. None of the French posts had permanent settlers; fur traders and missionaries simply visited them from time to time to conduct business. In the 1720s, the anti-French Fox tribe, led by war chief Kiala, raided French settlements on the Mississippi River and disrupted French trade on Lake Michigan. From 1728 to 1733, the Fox fought against the French-supported Potawatomi, Ojibwa, Huron and Ottawa tribes. In 1733, Kiala was captured and sold into slavery in the West Indies along with other captured Fox. Before the war, the Fox tribe numbered 1500, but by 1733, only 500 Fox were left. As a result, the Fox joined the Sac tribe. The details are unclear, but this war appears to have been part of the conflict that expelled the Dakota & Illinois peoples out onto the Great Plains, causing further displacement of other Chiwere, Caddoan & Algonquian peoples there—including the ancestors of the Ioway, Osage, Pawnee, Arikara, A'ani, Arapaho, Hidatsa, Cheyenne & Blackfoot. The British gradually took over Wisconsin during the French and Indian War, taking control of Green Bay in 1761 and gaining control of all of Wisconsin in 1763. Like the French, the British were interested in little but the fur trade. One notable event in the fur trading industry in Wisconsin occurred in 1791, when two free African Americans set up a fur trading post among the Menominee at present day Marinette. The first permanent settlers, mostly French Canadians, some Anglo-New Englanders and a few African American freedmen, arrived in Wisconsin while it was under British control. Charles Michel de Langlade is generally recognized as the first settler, establishing a trading post at Green Bay in 1745, and moving there permanently in 1764. In 1766 the Royal Governor of the new territory, Robert Rogers, engaged Jonathan Carver to explore and map the newly acquired territories for the Crown, and to search for a possible Northwest Passage. Carver left Fort Michilimackinac that spring and spent the next three years exploring and mapping what is now Wisconsin and parts of Minnesota. Settlement began at Prairie du Chien around 1781. The French residents at the trading post in what is now Green Bay, referred to the town as "La Bey", however British fur traders referred to it as "Green Bay", because the water and the shore assumed green tints in early spring. The old French title was gradually dropped, and the British name of "Green Bay" eventually stuck. The region coming under British rule had virtually no adverse effect on the French residents as the British needed the cooperation of the French fur traders and the French fur traders needed the goodwill of the British. During the French occupation of the region licenses for fur trading had been issued scarcely and only to select groups of traders, whereas the British, in an effort to make as much money as possible from the region, issued licenses for fur trading freely, both to British and French residents. The fur trade in what is now Wisconsin reached its height under British rule, and the first self-sustaining farms in the state were established at this time as well. From 1763 to 1780, Green Bay was a prosperous community which produced its own foodstuff, built graceful cottages and held dances and festivities. The United States acquired Wisconsin in the Treaty of Paris (1783). Massachusetts claimed the territory east of the Mississippi River between the present-day Wisconsin-Illinois border and present-day La Crosse, Wisconsin. Virginia claimed the territory north of La Crosse to Lake Superior and all of present-day Minnesota east of the Mississippi River. Shortly afterward, in 1787, the Americans made Wisconsin part of the new Northwest Territory. Later, in 1800, Wisconsin became part of Indiana Territory. Despite the fact that Wisconsin belonged to the United States at this time, the British continued to control the local fur trade and maintain military alliances with Wisconsin Indians. Chief Black Hawk, from History of the Indian Tribes of North America. The United States did not firmly exercise control over Wisconsin until the War of 1812. In 1814, the Americans built Fort Shelby at Prairie du Chien. During the war, the Americans and British fought one battle in Wisconsin, the July, 1814 Siege of Prairie du Chien, which ended as a British victory. The British captured Fort Shelby and renamed it Fort McKay, after Major William McKay, the British commander who led the forces that won the Battle of Prairie du Chien. However, the 1815 Treaty of Ghent reaffirmed American jurisdiction over Wisconsin, which was by then a part of Illinois Territory. Following the treaty, British troops burned Fort McKay, rather than giving it back to the Americans, and departed Wisconsin. To protect Prairie du Chien from future attacks, the United States Army constructed Fort Crawford in 1816, on the same site as Fort Shelby. Fort Howard was also built in 1816 in Green Bay. Significant American settlement in Wisconsin, a part of Michigan Territory beginning in 1818, was delayed by two Indian wars, the minor Winnebago War of 1827 and the larger Black Hawk War of 1832. The Winnebago War started when, in 1826, two Winnebago men were detained at Fort Crawford on charges of murder and then transferred to Fort Snelling in present-day Minnesota. The Winnebago in the area believed that both men had been executed. On June 27, 1827, a Winnebago war band led by Chief Red Bird and the prophet White Cloud (Wabokieshiek) attacked a family of settlers outside of Prairie du Chien, killing two men. They then went on to attack two keel-boats on the Mississippi River that were heading toward Fort Snelling, killing two men and injuring four more. Seven Winnebago warriors were killed in those attacks. The war band also attacked settlers on the lower Wisconsin River and the lead mines at Galena, Illinois. The war band surrendered at Portage, Wisconsin, rather than fighting the United States Army that was pursuing them. The state seal of Wisconsin contains a shovel and pickaxe, reflecting the importance of lead mining to Wisconsin's history. The resolution of these Indian conflicts opened the way for Wisconsin's settlement. Many of the region's first settlers were drawn by the prospect of lead mining in southwest Wisconsin. This area had traditionally been mined by Native Americans. However, after a series of treaties removed the Indians, the lead mining region was opened to white miners. Thousands rushed in from across the country to dig for the "gray gold". By 1829, 4,253 miners and 52 licensed smelting works were in the region. Expert miners from Cornwall, England, formed a large part of the wave of immigrants. Boom towns like Mineral Point, Platteville, Shullsburg, Belmont, and New Diggings sprang up around mines. The first two federal land offices in Wisconsin were opened in 1834 at Green Bay and at Mineral Point. By the 1840s, southwest Wisconsin mines were producing more than half of the nation's lead, which was no small amount, as the United States was producing annually some 31 million pounds of lead. Wisconsin was dubbed the "Badger State" because of the lead miners who first settled there in the 1820s and 1830s. Without shelter in the winter, they had to "live like badgers" in tunnels burrowed into hillsides. Although the lead mining area drew the first major wave of settlers, its population would soon be eclipsed by growth in Milwaukee. Milwaukee, along with Sheboygan, Manitowoc, and Kewaunee, can be traced back to a series of trading posts established by the French trader Jacques Vieau in 1795. Vieau's post at the mouth of the Milwaukee River was purchased in 1820 by Solomon Juneau, who had visited the area as early as 1818. Juneau moved to what is now Milwaukee and took over the trading post's operation in 1825. When the fur trade began to decline, Juneau focused on developing the land around his trading post. In the 1830s he formed a partnership with Green Bay lawyer Morgan Martin, and the two men bought 160 acres (0.6 km²) of land between Lake Michigan and the Milwaukee River. There they founded the settlement of Juneautown. Meanwhile, an Ohio businessman named Byron Kilbourn began to invest in the land west of the Milwaukee River, forming the settlement of Kilbourntown. South of these two settlements, George H. Walker founded the town of Walker's Point in 1835. Each of these three settlements engaged in a fierce competition to attract the most residents and become the largest of the three towns. In 1840, the Wisconsin State Legislature ordered the construction of a bridge over the Milwaukee River to replace the inadequate ferry system. In 1845, Byron Kilbourn, who had been trying to isolate Juneautown to make it more dependent on Kilbourntown, destroyed a portion of the bridge, which started the Milwaukee Bridge War. For several weeks, skirmishes broke out between the residents of both towns. No one was killed but several people were injured, some seriously. On January 31, 1846 the settlements of Juneautown, Kilbourntown, and Walker's Point merged into the incorporated city of Milwaukee. Solomon Juneau was elected mayor. The new city had a population of about 10,000 people, making it the largest city in the territory. Milwaukee remains the largest city in Wisconsin to this day. Wisconsin Territory was created by an act of the United States Congress on April 20, 1836. By fall of that year, the best prairie groves of the counties surrounding Milwaukee were occupied by New England farmers. The new territory initially included all of the present day states of Wisconsin, Minnesota, and Iowa, as well as parts of North and South Dakota. At the time the Congress called it the "Wiskonsin Territory". The first territorial governor of Wisconsin was Henry Dodge. He and other territorial lawmakers were initially busied by organizing the territory's government and selecting a capital city. The selection of a location to build a capitol caused a heated debate among the territorial politicians. At first, Governor Dodge selected Belmont, located in the heavily populated lead mining district, to be capital. Shortly after the new legislature convened there, however, it became obvious that Wisconsin's first capitol was inadequate. Numerous other suggestions for the location of the capital were given representing nearly every city that existed in the territory at the time, and Governor Dodge left the decision up to the other lawmakers. The legislature accepted a proposal by James Duane Doty to build a new city named Madison on an isthmus between lakes Mendota and Monona and put the territory's permanent capital there. In 1837, while Madison was being built, the capitol was temporarily moved to Burlington. This city was transferred to Iowa Territory in 1838, along with all the lands of Wisconsin Territory west of the Mississippi River. Wyman calls Wisconsin a "palimpsest" of layer upon layer of peoples and forces, each imprinting permanent influences. He identified these layers as multiple "frontiers" over three centuries: Native American frontier, French frontier, English frontier, fur-trade frontier, mining frontier, and the logging frontier. Finally the coming of the railroad brought the end of the frontier. The historian of the frontier, Frederick Jackson Turner grew up in Wisconsin during its last frontier stage, and in his travels around the state he could see the layers of social and political development. One of Turner's last students, Merle Curti used in-depth analysis of local history in Trempeleau County to test Turner's thesis about democracy. Turner's view was that American democracy, "involved widespread participation in the making of decisions affecting the common life, the development of initiative and self-reliance, and equality of economic and cultural opportunity. It thus also involved Americanization of immigrant." Curti found that from 1840 to 1860 in Wisconsin the poorest groups gained rapidly in land ownership, and often rose to political leadership at the local level. He found that even landless young farm workers were soon able to obtain their own farms. Free land on the frontier therefore created opportunity and democracy, for both European immigrants as well as old stock Yankees. By the mid-1840s, the population of Wisconsin Territory had exceeded 150,000, more than twice the number of people required for Wisconsin to become a state. In 1846, the territorial legislature voted to apply for statehood. That fall, 124 delegates debated the state constitution. The document produced by this convention was considered extremely progressive for its time. It banned commercial banking, granted married women the right to own property, and left the question of African-American suffrage to a popular vote. Most Wisconsinites considered the first constitution to be too radical, however, and voted it down in an April 1847 referendum. In December 1847, a second constitutional convention was called. This convention resulted in a new, more moderate state constitution that Wisconsinites approved in a March 1848 referendum, enabling Wisconsin to become the 30th state on May 29, 1848. Wisconsin was the last state entirely east of the Mississippi River (and by extension the last state formed entirely from territory assigned to the U.S. in the 1783 Treaty of Paris) to be admitted to the Union. With statehood, came the creation of the University of Wisconsin–Madison, which is the state's oldest public university. The creation of this university was set aside in the state charter. In 1847, the Mineral Point Tribune reported that the town's furnaces were producing 43,800 pounds (19,900 kg) of lead each day. Lead mining in southwest Wisconsin began to decline after 1848 and 1849 when the combination of less easily accessible lead ore and the California Gold Rush made miners leave the area. The lead mining industry in mining communities such as Mineral Point managed to survive into the 1860s, but the industry was never as prosperous as it was before the decline. By 1850 Wisconsin's population was 305,000. Roughly a third (103,000) were Yankees from New England and western New York state. The second largest group were the Germans, numbering roughly 38,000, followed by 28,000 British immigrants from England, Scotland and Wales. There were roughly 63,000 Wisconsin-born residents of the state. The Yankee migrants would be the dominant political class in Wisconsin for many years. A railroad frenzy swept Wisconsin shortly after it achieved statehood. The first railroad line in the state was opened between Milwaukee and Waukesha in 1851 by the Chicago, Milwaukee, St. Paul and Pacific Railroad. The railroad pushed on, reaching Milton, Wisconsin in 1852, Stoughton, Wisconsin in 1853, and the capital city of Madison in 1854. The company reached its goal of completing a rail line across the state from Lake Michigan to the Mississippi River when the line to Prairie du Chien was completed in 1857. Shortly after this, other railroad companies completed their own tracks, reaching La Crosse in the west and Superior in the north, spurring development in those cities. By the end of the 1850s, railroads crisscrossed the state, enabling the growth of other industries that could now easily ship products to markets across the country. The Little White Schoolhouse, in Ripon, 1854, which hosted the first meeting of what became the national Republican Party. Nelson Dewey, the first governor of Wisconsin, was a Democrat. Born in Lebanon, Connecticut, Dewey's father's family had lived in New England since 1633, when their ancestor, Thomas Due, had come to America from Kent County, England. Dewey oversaw the transition from the territorial to the new state government. He encouraged the development of the state's infrastructure, particularly the construction of new roads, railroads, canals, and harbors, as well as the improvement of the Fox and Wisconsin Rivers. During his administration, the State Board of Public Works was organized. Dewey was an abolitionist and the first of many Wisconsin governors to advocate against the spread of slavery into new states and territories. The home Dewey built near Cassville is now a state park. Between 1848 and 1862, Wisconsin had three Democratic governors, all of whom were in office prior to 1856, four Republican governors, all of whom were in office after 1856, and one Whig governor, Leonard J. Farwell, who served from 1852 to 1854. Under Farwell's governorship, Wisconsin became the second state to abolish capital punishment. In the presidential elections of 1848 and 1852, the Democratic Party won Wisconsin. In the elections of 1856, 1860, and 1864, the Republican Party won the state. Between the 1840s and 1860s, settlers from New England, New York and Germany arrived in Wisconsin. Some of them brought radical political ideas to the state. In the 1850s, stop-overs on the underground railroad were set up in the state and abolitionist groups were formed. One such group was the Republican party. On March 20, 1854, the first county meeting of the Republican Party of the United States, consisting of about thirty people, was held in the Little White Schoolhouse in Ripon, Wisconsin. Ripon claims to be the birthplace of the Republican Party, as does Jackson, Michigan, where the first statewide convention was held. A notable instance of abolitionism in Wisconsin was the rescue of Joshua Glover, an escaped slave from St. Louis who sought refuge in Racine, Wisconsin in 1852. He was caught in 1854 by federal marshals and put in a jail at Cathedral Square in Milwaukee, where he waited to be returned to his owner. A mob of 5,000 people led by Milwaukee abolitionist Sherman Booth, himself a "Yankee" transplant from rural New York, sprung Glover from jail and helped him escape to Canada via the underground railroad. In the 1850s, two-thirds of immigrants to Wisconsin came from the eastern United States, the other one-third being foreign-born. The majority of the foreign born were German immigrants. Many Irish and Norwegian immigrants also came to Wisconsin in the 1850s. Northern Europeans, many of whom were persecuted in their home countries because of their support for the failed bourgeois Revolutions of 1848, often chose Wisconsin because of the liberal constitution of human rights such as the state's unusual recognition of immigrants' right to vote and rights to citizenship. Yankee settlers from New England started arriving in Wisconsin in the 1830s spread throughout the southern half of the territory. They dominated early politics. Most of them started as farmers, but the larger proportion moved to towns and cities as entrepreneurs, businessmen and professionals. The color guard of the Wisconsin 8th Infantry with Old Abe. Wisconsin enrolled 91,379 men in the Union Army during the American Civil War. 272 of enlisted Wisconsin men were African American, and the rest were white. Of these, 3,794 were killed in action or mortally wounded, 8,022 died of disease, and 400 were killed in accidents. The total mortality was 12,216 men, about 13.4 percent of total enlistments. Many soldiers trained at Camp Randall, which currently houses the University of Wisconsin's athletic stadium. Most Wisconsin troops served in the western theater, although several Wisconsin regiments fought in the east, such as the 2nd Wisconsin Volunteer Infantry Regiment, 6th Wisconsin Volunteer Infantry Regiment, and 7th Wisconsin Volunteer Infantry Regiment, which formed part of the Iron Brigade. These three regiments fought in the Northern Virginia Campaign, the Maryland Campaign, the Battle of Fredericksburg, the Battle of Chancellorsville, the Gettysburg Campaign, the Battle of Mine Run, the Overland Campaign, the Siege of Petersburg, and the Appomattox Campaign. The 8th Wisconsin Volunteer Infantry Regiment, which fought in the western theater of war, is also worthy of mention, having fought at the Battle of Iuka, the Siege of Vicksburg, the Red River Campaign, and the Battle of Nashville. The 8th Wisconsin is also known for its mascot, Old Abe. A stone barn built for cows in Wisconsin. The circular silo was used to store feed. Agriculture was a major component of the Wisconsin economy during the 19th century. Wheat was a primary crop on early Wisconsin farms. In fact, during the mid 19th century, Wisconsin produced about one sixth of the wheat grown in the United States. However, wheat rapidly depleted nutrients in the soil, especially nitrogen, and was vulnerable to insects, bad weather, and wheat leaf rust. In the 1860s, chinch bugs arrived in Wisconsin and damaged wheat across the state. As the soil lost its quality and prices dropped, the practice of wheat farming moved west into Iowa and Minnesota. Some Wisconsin farmers responded by experimenting with crop rotation and other methods to restore the soil's fertility, but a larger number turned to alternatives to wheat. In parts of northern Wisconsin, farmers cultivated cranberries and in a few counties in south central Wisconsin, farmers had success growing tobacco, but the most popular replacement for wheat was dairy farming. As wheat fell out of favor, many Wisconsin farmers started raising dairy cattle and growing feed crops, which were better suited to Wisconsin's climate and soil. One reason for the popularity of dairy farming was that many of Wisconsin's farmers had come to the state from New York, the leading producer of dairy products at the time. In addition, many immigrants from Europe brought an extensive knowledge of cheese making. Dairying was also promoted by the University of Wisconsin–Madison's school of agriculture, which offered education to dairy farmers and researched ways to produce better dairy products. The first test of butterfat content in milk was developed at the university, which allowed for consistency in the quality of butter and cheese. By 1899, over ninety percent of Wisconsin farms raised dairy cows and by 1915, Wisconsin had become the leading producer of dairy products in the United States, a position it held until the 1990s. The term America's Dairyland appeared in newspapers as early as 1913 when the state's butterfat production became first in the nation. In 1939 the state legislature enacted a bill to add the slogan to the state's automobile license plates. It continues to be the nation's largest producer of cheese, no longer focusing on the raw material (milk) but rather the value-added products. Because of this, Wisconsin continues to promote itself as "America's Dairyland", Wisconsinites are referred to as cheeseheads in some parts of the country, including Wisconsin, and foam cheesehead hats are associated with Wisconsin and its NFL team, the Green Bay Packers. The first brewery in Wisconsin was opened in 1835 in Mineral Point by brewer John Phillips. A year later, he opened a second brewery in Elk Grove. In 1840, the first brewery in Milwaukee was opened by Richard G. Owens, William Pawlett, and John Davis, all Welsh immigrants. By 1860, nearly 200 breweries operated in Wisconsin, more than 40 of them in Milwaukee. The huge growth in the brewing industry can be accredited, in part, to the influx of German immigrants to Wisconsin in the 1840s and 1850s. Milwaukee breweries also grew in volume due to the destruction of Chicago's breweries during the great Chicago fire (see: http://www.beerhistory.com/library/holdings/milwaukee.shtml). In the second half of the 19th century, four of the largest breweries in the United States opened in Milwaukee: Miller Brewing Company, Pabst Brewing Company, Valentin Blatz Brewing Company, and Joseph Schlitz Brewing Company. In the 20th century Pabst absorbed Blatz and Schlitz, and moved its brewery and corporate headquarters to California. Miller continues to operate in Milwaukee. The Jacob Leinenkugel Brewing Company opened in Chippewa Falls, Wisconsin in 1867 and continues to operate there to this day. Logs being transported on a sleigh after being cut. Agriculture was not viable in the densely forested northern and central parts of Wisconsin. Settlers came to this region for logging. The timber industry first set up along the Wisconsin River. Rivers were used to transport lumber from where the wood was being cut, to the sawmills. Sawmills in cities like Wausau and Stevens Point sawed the lumber into boards that were used for construction. The Wolf River also saw considerable logging by industrious Menominee. The Black and Chippewa Rivers formed a third major logging region. That area was dominated by one company owned by Frederick Weyerhaeuser. The construction of railroads allowed loggers to log year round, after rivers froze, and go deeper into the forests to cut down previously unshippable wood supplies. Wood products from Wisconsin's forests such as doors, furniture, beams, shipping boxes, and ships were made in industrial cities with connects to the Wisconsin lumber industry such as Chicago, Milwaukee, Sheboygan, and Manitowoc. Milwaukee and Manitowoc were centers for commercial ship building in Wisconsin. Many cargo ships built in these communities were used to transport lumber from logging ports to major industrial cities. Later a growing paper industry in the Fox River Valley made use of wood pulp from the state's lumber industry. Logging was a dangerous trade, with high accident rates. On October 8, 1871, the Peshtigo Fire burned 1,875 square miles (4,850 km²) of forest land around the timber industry town of Peshtigo, Wisconsin, killing between 1,200 and 2,500 people. It was the deadliest fire in United States history. From the 1870s to the 1890s, much of the logging in Wisconsin was done by immigrants from Scandinavia. By the beginning of the twentieth century, logging in Wisconsin had gone into decline. Many forests had been cleared and never replanted and large corporations in the Pacific Northwest took business away from the Wisconsin industry. The logging companies sold their land to immigrants and out of work lumberjacks who hoped to turn the acres of pine stumps into farms, but few met with success. 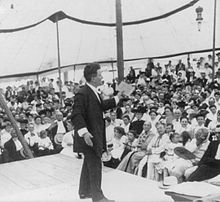 Wisconsin Governor Robert La Follette addressing an assembly in Decatur, Illinois, 1905. The early 20th century was also notable for the emergence of progressive politics championed by Robert M. La Follette. Between 1901 and 1914, Progressive Republicans in Wisconsin created the nation's first comprehensive statewide primary election system, the first effective workplace injury compensation law, and the first state income tax, making taxation proportional to actual earnings. The progressive Wisconsin Idea also promoted the statewide expansion of the University of Wisconsin through the UW-Extension system at this time. Later, UW economics professors John R. Commons and Harold Groves helped Wisconsin create the first unemployment compensation program in the United States in 1932. In the immediate aftermath of World War II, citizens of Wisconsin were divided over things such as the creation of the United Nations, support for the European recovery, and the growth of the Soviet Union's power. However, when Europe divided into Communist and capitalist camps and the Communist revolution in China succeeded in 1949, public opinion began to move towards support for the protection of democracy and capitalism against Communist expansion. Wisconsin took part in several political extremes in the mid to late 20th century, ranging from the anti-communist crusades of Senator Joseph McCarthy in the 1950s to the radical antiwar protests at UW-Madison that culminated in the Sterling Hall bombing in August 1970. The state became a leader in welfare reform under Republican Governor Tommy Thompson during the 1990s. The state's economy also underwent further transformations towards the close of the 20th century, as heavy industry and manufacturing declined in favor of a service economy based on medicine, education, agribusiness, and tourism. In 2011, Wisconsin became the focus of some controversy when newly elected governor Scott Walker proposed and then successfully passed and enacted 2011 Wisconsin Act 10, which made large changes in the areas of collective bargaining, compensation, retirement, health insurance, and sick leave of public sector employees, among other changes. A series of major protests by union supporters took place that year in protest to the changes, and Walker survived a recall election held the next year, becoming the first governor in United States history to do so. Walker enacted other bills promoting conservative governance, such as a right-to-work law, abortion restrictions, and legislation removing certain gun controls. Van Ells, Mark D. Wisconsin [On-The-Road Histories]. (2009). Fries, Robert F. Empire in Pine: The Story of Lumbering in Wisconsin, 1830–1900 (1951). Nesbit, Robert C. The History of Wisconsin, Volume 3: Industrialization and Urbanization 1873–1893. Madison: State Historical Society of Wisconsin, 1973. Smith, Alice. The History of Wisconsin, Volume 1: From Exploration to Statehood. Madison: State Historical Society of Wisconsin, 1973. Thompson, William F. The History of Wisconsin: Volume 6: Continuity and Change 1940-1965. Madison: State Historical Society of Wisconsin, 1988. ^ Milwaukee Public Museum. "Paleo-Indians (10000 BC-8500 BC)". ^ Milwaukee Public Museum. "Old Copper Culture". ^ Milwaukee Public Museum. "Early, Middle and Late Archaic (8,000 BC-1000 BC)". ^ Mississippi Valley Archaeology Center. "Food: Hunting, Gathering and Gardening". ^ Milwaukee Public Museum. "Early Woodland (1000 BC-300 BC)". ^ Milwaukee Public Museum. "Middle Woodland (300 BC-400 AD)". ^ Wisconsin Historical Society. "Effigy Mounds Culture"
^ Milwaukee Public Museum. "Late Woodland (400 AD-1100 AD)". ^ "Relation of the Conquest of Florida Presented by Luys Hernandez de Biedma in the Year 1544 to the King of Spain in Council". Retrieved 2010-02-10. ^ George E. Sabo (2008). "Tunica and Koroa Indians". The Indians of Arkansas website. University of Arkansas. Retrieved 2010-02-10. ^ Joseph, Frank "Unearthing Ancient America: The Lost Sagas of Conquerors, Castaways, and Scoundrels" 2008. ^ Milwaukee Public Museum. "Aztalan Collection". ^ Wisconsin Historical Society. "Mississippian Culture and Aztalan". ^ Mississippi Valley Archaeology Center. "Oneota". ^ Rodesch, Gerrold C. (1984). "Jean Nicolet". University of Wisconsin–Green Bay. Retrieved July 31, 2016. ^ "Turning Points in Wisconsin History: Arrival of the First Europeans". Wisconsin Historical Society. Retrieved July 31, 2016. ^ in collaboration with Claude Perrault (1979) . "Perrot, Nicholas". In Hayne, David (ed.). Dictionary of Canadian Biography. II (1701–1740) (online ed.). University of Toronto Press. ^ John Willis (1911). "Minnesota". The Catholic Encyclopedia. 10. New York: Appleton. ^ Rites of Conquest: The History and Culture of Michigan's Native Americans, Charles E. Cleland, University of Michigan Press, 1992. ^ Bradbury, John: Travels in the Interior of America in the Years 1809,1810, and 1811. Ann Arbor, 1966, p. 165. ^ "History". Fort Crawford Museum. Retrieved April 9, 2018. ^ "Chapter 6". History of Crawford and Richland Counties, Wisconsin. 1. Springfield, Ill.: Union Publishing Co. 1884. Retrieved 2009-11-15. ^ Risjord, Norman K. (2007). Wisconsin: The History of the Badger State (2 ed.). Madison, Wisconsin: Trails Books. p. 61. ^ Risjord, Norman K. (2007). Wisconsin: The Story of the Badger State. Madison, Wisconsin: Trails Books. p. 63. ISBN 978-1-931599-87-0. ^ Stanley H. Cravens (1983). "Capitals and Capitols in Early Wisconsin". In Wisconsin Legislative Reference Bureau (ed.). State of Wisconsin 1983-1984 Blue Book. Madison: author. ^ Robert C. Nesbit. Wisconsin: A History. 2nd ed. Madison: University of Wisconsin Press, 1989, p. 151. ^ "Dead! Ex.-Governor Nelson Dewey Passes Quietly Away". The Cassville Index. Cassville, Wisconsin. July 25, 1889. pp. 1–3. Retrieved 2008-09-11. ^ a b c d e f Toepel, M. G.; Hazel L. Kuehn, eds. (1960). "Wisconsin's Former Governors, 1848–1959". The Wisconsin Blue Book, 1960. Wisconsin Legislative Reference Library. pp. 71–74. Retrieved 2008-09-17. ^ Richard Sisson, Christian K. Zacher, and Andrew R. L. Cayton (eds.). The American Midwest: An Interpretive Encyclopedia. Bloomington: Indiana University Press, 2007, p. 195. ^ "19th-Century Immigration". Wisconsin Historical Society. Retrieved April 9, 2018. ^ "Farming and Rural Life". Wisconsin Historical Society. Retrieved April 9, 2018. ^ "The Rise of Dairy Farming". Wisconsin Historical Society. Retrieved April 9, 2018. ^ "2001 Milk Production" (PDF). Marketing Service Bulletin. United States Department of Agriculture. February 2002. Archived from the original (PDF) on 2007-02-21. Retrieved 2007-03-16. ^ "Supremacy of Wisconsin in Dairy Interests". Marshfield Times. September 10, 1913. pp. 1, 4. ^ "Wisconsin State Symbols in Wisconsin Blue Book 2005–2006, p. 968. ^ ""America's Dairyland" to Be Put on License Plates". Manitowoc Herald-Times. May 16, 1939. p. 1. ^ "Take a taste test of Wisconsin's history". Milwaukee Journal Sentinel. April 28, 2009. Retrieved April 9, 2018. ^ "Birth of Milwaukee's brewing industry is interesting story". The Milwaukee Journal. March 19, 1916. Retrieved April 9, 2018. ^ "Brewing and Prohibition". Wisconsin Historical Society. Retrieved April 9, 2018. ^ "Logging and Forest Products". Wisconsin Historical Society. Retrieved April 9, 2018. ^ Ware, Alan (2002). The American direct primary: party institutionalization and transformation in the North. Cambridge, England: Cambridge University Press. p. 118. ISBN 978-0-521-81492-8. ^ Ranney, Joseph. "Wisconsin's Legal History: Law and the Progressive Era, Part 3: Reforming the Workplace". Archived from the original on September 18, 2012. Retrieved March 13, 2010. ^ Stark, John (Autumn 1987). "The Establishment of Wisconsin's Income Tax". Wisconsin Magazine of History. 71 (1): 27–45. ^ Stark, Jack (1995). "The Wisconsin Idea: The University's Service to the State". The State of Wisconsin Blue Book, 1995–1996. Madison: Legislative Reference Bureau. pp. 101–79. OCLC 33902087. ^ "Tommy Thompson: Human Services Reformer". September 4, 2004. Retrieved March 13, 2010. ^ Condon, Stephanie (2011-03-11). "Wisconsin Gov. Scott Walker signs anti-union bill – but Democrats say they're the political victors". CBS News. Retrieved 2011-03-12. ^ Montopoli, Brian (June 5, 2012). "CBS News: Scott Walker wins Wisconsin recall election". CBS News. ^ Governor Walker of Wisconsin signs right-to-work bill, nytimes.com, March 10, 2015. ^ Stein, Jason (July 20, 2015). "Scott Walker Signs 20-Week Abortion Ban, Trooper Pay Raise". Milwaukee Journal Sentinel. Retrieved November 24, 2016. ^ Stein, Jason (July 8, 2011). "Walker Signs Concealed-Carry Measure Into Law". Milwaukee Journal Sentinel. Retrieved October 30, 2016. ^ Stein, Jason (December 7, 2011). "Walker Signs 'Castle Doctrine' Bill, Other Measures". Milwaukee Journal Sentinel. Retrieved October 30, 2016. ^ Strauss, Daniel (June 24, 2015). "Scott Walker Signs Two Pro-Gun Bills". Politico. Retrieved October 30, 2016.